I would like to share our recent work published in Physical Review Letters. The mechanical properties of materials are insensitive to space inversion, even when they are crystallographically asymmetric. 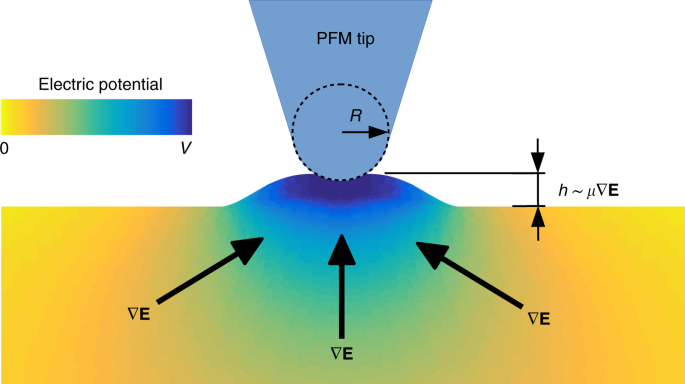 In practice, this means that turning a piezoelectric crystal upside down or switching the polarization of a ferroelectric should not change its mechanical response. Strain gradients, however, introduce an additional source of asymmetry that has mechanical consequences. This work has been recently published in Nature Nanotechnology. Cracks generate the largest strain gradients that any material can withstand. Flexoelectricity (coupling between strain gradient and polarization) must therefore play an important role in fracture physics. Here we use a self-consistent continuum model to evidence two consequences of flexoelectricity in fracture: the resistance to fracture increases as structural size decreases, and it becomes asymmetric with respect to the sign of polarization. The latter phenomenon manifests itself in a range of intermediate sizes where piezo- and flexoelectricity compete. Flexoelectricity is an electromechanical effect coupling polarization to strain gradients. It fundamentally differs from piezoelectricity because of its size-dependence and symmetry. Flexoelectricity is generally perceived as a small effect noticeable only at the nanoscale. Since ferroelectric ceramics have a particularly high flexoelectric coefficient, however, it may play a significant role as piezoelectric transducers shrink to the sub-micrometer scale. Flexoelectricity is a size-dependent electromechanical mechanism coupling polarization and strain gradient. It exists in a wide variety of materials, and is most noticeable for nanoscale objects, where strain gradients are higher. Simulations are important to understand flexoelectricity because experiments at very small scales are difficult, and analytical solutions are scarce.